Leggo my Eggo. Seriously, let go of it. It's a great new cereal and I want to keep it. Wow. It's been while since a new cereal inspired me to poetry. I've tried a lot of new cereals in the last couple months and this is one of the best. If you can come up with a verse that rhymes "oat flour" and "rich in fiber" with "corn pops", please email me and I'll add it. A few things I wanted to say weren't conducive to my prose. The theme of the verse would be that Eggo Cereal tastes somewhat like you'd expect "Maple Corn Pops" to taste. Despite the cereal's sweetness, it is fairly healthy - made with oat flour and rich in fiber. It's a simple cereal, yet the flavor has a subtle complexity. The taste unfolds as you eat it. Bottom Line: I'd buy this cereal again and I'm an awesome poet. What do you think of Eggo Cereal? 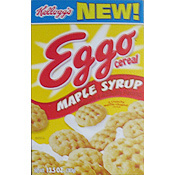 Please, please bring back the Eggo waffle maple syrup cereal. I am not a big cereal eater. But this cereal I could eat everyday. I have been looking for this cereal for years now. This was one of my top favorite cereals. Probably even #1. Best cereal ever... why did it get discontinued? Unbelievable! I love this cereal. I haven't had it in quite a while, but I think the syrup taste of an Eggo waffle is very prevalent here and will not be missed. They're great! Best cereal ever... bar none. The maple flavor... authentic and addicting. What are you guys smokin? This cereal is weak! Flavor is bland - like honeycomb with fake maple flavor. Can't compare to cap'n crunch original or cinnamon toast crunch french toast. I would much rather waffle crisp... it had a stronger maple flavor and stayed crunchy longer. I bought this cereal at Wal Mart. Never tried it. Going to have it tomorrow morning. See how good it is. Man this cereal took away one of my favorite cereals Waffle Crisp. Pretty sad that one of the best Post cereals ever made had to get replaced by a crappy eggo cereal. R.I.P Waffle Crisp where I live:(1996-2007) You will forever be remembered. This cereal has made it high up on my top 10 list of best cereals. To be compared to being almost as good as Cinnamon Toast Crunch, means it's that great. My favorite cereal! Not sickening sweet, doesn't get super soggy, great flavor and crunch. Scared it's so good they'll end up discontinuing it! Eggo Cereal is a total ripoff of Waffle Crisp and Waffle Crisp is much better. It's like eating Waffle Crisp with half the flavor missing. This is by far the most delicious new cereal I've tried in the last five years. The buttery maple flavor is robust and not cloying, and the little waffles have a nice crunch. 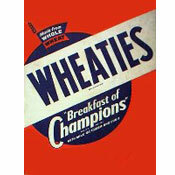 I really hope Kellogg's keeps this one in the market for many years to come! i friggin love these. i ate these non-stop all day till the mother trucker was gonne! my sis buys one every two weeks cause she works fore kellogs, and she brings home a lot of cereal, and thats the first one to go. YUM! Omg! This cereal is amazing absolutley one of the best cereals ever! I think about eating this 24-7 weather out of the box or with milk. Its so good...I finished the whole box in 2 days..yes its true this is all I ate for 2 straight days..they're that good. So my mom hid them from me..but I know where they are..she has no clue that box is empty....but anyways the taste is awesome, that crunch is yummy, even the shape makes them taste better..this is so fun to eat! You haven't lived till u've tried this cereal! Buy it! The cereal is amazing. I work in a supermarket and we stopped selling them. I guess cause they weren't a good seller. Shocking but I had to go to another supermarket and buy 4 boxes. Where did u get them for $2.99. I paid almost $5 a box. I wish Costco had them. BIG SIZE. I would pay anything for them. My favorite cereal in the whole world. It was one of my major pregnancy cravings too. MMMMM!!!!! I just made the best cereal ever using the Eggo waffle cereal as a base, adding sliced strawberries, real syrup, milk and a splash of almond soy milk. I swear to God it was the best bowl of cereal my mouth has had the pleasure of eating. It was so good that I had to wake my wife up (it's 6 am) to try a bite. This stuff is the BOOOMB!!! I tried this cereal because of your great review, and I'm so glad I did! It's so maple syrupy, and it soaks up my milk perfectly. And for a sugary cereal it's not as unhealthy as some of the other ones on the market. Thanks for the recommendation!! It's a little too cinnamony, but I'm eating it right now, and other than the overload of cinnamon, it is HEAVENLY. 4 out of five. Egg-O cereal is very good. Mmmmm, I just finished off a bowl myself. Nice stuff! I live in Montreal as well. This stuff is worth going to the border for (I do) its that good! It is awesome cereal. They have finally nailed the perfect shape for proper rate of milk absorption in a cereal. I now am addicted to it. It also reminds me of maple cream cookies, which I used to get when I lived up North and cant, get down here in the South. Great taste (it builds in flavor, first bite didn�t reveal much). Never gets too soggy. Hold s milk nicely (like cinnamon toast crunch). Doesn�t cut roof of your mouth like most other Kellogg cereals ala fruit loops. Keep it on the shelves!